Since I didn’t find the time to re-watch (and thus review) the trilogy, let’s do a short recap: “Jurassic Park” is a masterpiece, and Steven Spielberg’s last perfect blockbuster (10/10). “The Lost World” is a delightfully distinct movie with some tremendously gripping scenes (like the trailer) and a great ending (yes, I’m actually one of those who really liked the ending in San Diego), but which still falls short of the original (7/10). And “Jurassic Park III” can be found in the dictionary under “unworthy sequel”; it was just an utilization of leftovers, and a complete misfire (3/10). As for “Jurassic World”, it’s mostly an exercise in nostalgia – but that doesn’t have to be a bad thing, and in this case, it indeed isn’t. From all the sequels, this is the closest to the original, which is at the same time its biggest strength and its biggest weakness. Strength, because some of the best moments of the movie are those that allude to “Jurassic Park”. Weakness, because it also means that “Jurassic World” frequently reminds us of an ultimately better movie. What I liked most about it, is the concept. I have to say, in hindsight it seems almost strange that it took them three sequels to go there. I would have seemed like the logical next step after the first one. Anyway, I really loved the beginning of the movie, where we come to Jurassic World. There’s something very elevating about seeing John Hammonds vision finally fulfilled – even though we know that it can’t and won’t last long. Prior to seeing the movie, one of the things that had me very concerned was the new dinosaur, since I feared another Spinosaurus-debacle. The problem there, of course, was not that they featured it as the new baddie of “Jurassic Park III”, but rather how they featured it. Trying to tell us that it’s bigger, badder and meaner by letting it kill the T-Rex in a 1-minute-battle was just offensive. He’s not the king of dinosaurs because of some movie appearance, he’s been the figurehead of dinosaurs for as long as mankind – and young kids in particular – have been fascinated by them. You just can’t extinguish a legacy like that in one single scene. You can give us a bigger and meaner dinosaur, but that doesn’t necessarily also make it a better/cooler one. The T-Rex will always be the icon of dinosaurs, period. Thankfully, Colin Trevorrow understands that. Yes, he gives us a new baddie in the Indominous Rex, but he’s not there to replace the T-Rex. With that alone, he shows a bigger understanding of why “Jurassic Park” worked so well, than Joe Johnston did during his entire (misguided) attempt – and the movie is all the better for it. I also really liked how “Jurassic World” mixed the old with the new. Yes, there are some very nostalgic scenes, and some great references to the first one, but they don’t simply content themselves with offering just a nostalgic trip into the (cinematic) past. Instead, they also present some new and fresh ideas, like the training of the Velociraptors. This was another element that I was very sceptical about beforehand, however, I needn’t have worried. The raptors are still very much extremely dangerous creatures, and the alliance that Owen forges with them is an uneasy one. They are also only let loose as a last resort. And, without giving too much away, things don’t necessarily go as planned. Anyway, everyone who feared that our favorite “Jurassic Park”-baddies would become harmless pets can rest assured. Another plus was the nice meta-level, with Claire talking about how simply offering the audience some dinosaurs isn’t enough any more – which obviously didn’t just apply to the visitors of the park, but also the cinemagoers. There were also a couple of really great individual scenes (which I don’t want to spoil). I also quite liked the banter between Owen and Claire. One could say that romances like that are a standard element of modern blockbusters; however, we actually never had something like that in the “Jurassic Park”-films, thus I thought it was an interesting approach. Finally, Michael Giacchino’s score was just wonderful. He’s not above citing John Williams’ iconic theme when its appropriate, which is definitely a big plus. However, I also quite liked the new theme, and his material in general. Like the rest of the movie, he perfectly mixed the old with the new. One aspect where they unfortunately stray from the tradition of the trilogy are the effects, who, apart from one significant deviation, come solely out of the PC. Now, mind you, the CGI does look way better than it did in the trailer (even though the Mesosaurus still isn’t something to write home about, effects-wise), and especially the Raptors and the T-Rex were extremely well done. The Indominous Rex looked quite good, too. However, there are some shots where it’s just CGI-overkill. And overall, I really would have preferred if they would have used animatronics whenever possible. I didn’t expect them to build a life-sized T-Rex or I-Rex (since that would be far more expensive than just doing it on the computer), but how about building just the head, so that you can use it in some of the more dramatic, close-up moments? So unfortunately, in this regard, “Jurassic World” shows one of the huge failings of modern blockbusters, compared to the movie it so much aspires to. In “Jurassic Park”, Spielberg used CGI as a last resort. Nowadays, it’s used all the friggin’ time, because it’s cheaper and easier. However, due to that, you lose some of the magic of the blockbusters of old. Also, the whole movie has a very typical, shiny, bright modern blockbuster look/sheen to it, which also sets it apart from the original that it tries to imitate. And as good as the effects were, overall, there also were a couple of scenes where “Jurassic World” unfortunately looked a little fake. Lastly, I really could have done without Hoskins, who seemed like a rather unnecessary (villainous) character, and who didn’t really add anything to the movie. Overall, though, I enjoyed this nostalgic trip to “Jurassic World” more than I thought I would. For all readers who understand german, you can find my even more elaborate fictionBOX-review here. Also, my buddy Maynard reviewed “Jurassic World” as well, and even added short reviews of the entire trilogy. For once, we’re actually pretty much in agreement! 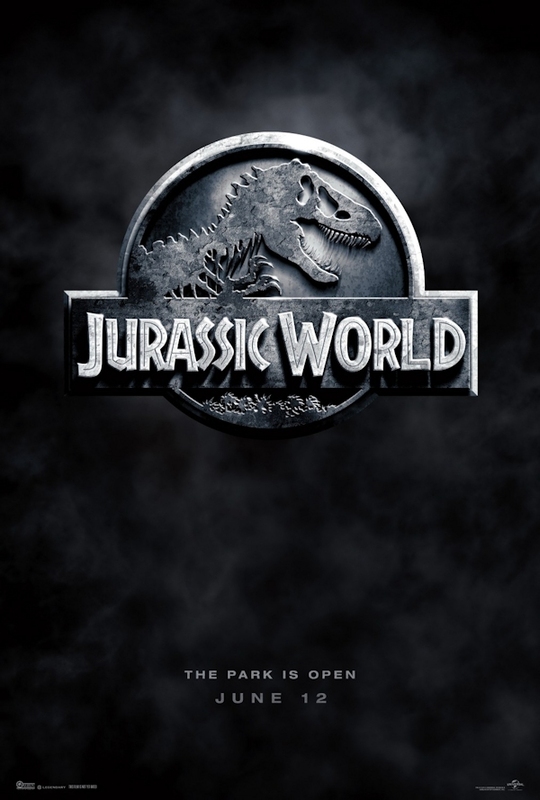 This entry was posted in cinema 2015, movie reviews, new releases and tagged 2015, 3d, adventure, Bryce Hallas Doward, Chris Pratt, cinema, Colin Trevorrow, dinosaurs, imax, Jurassic World, Michael Giacchino. Bookmark the permalink.